I'm still trying to figure out when all recipes started beginning with"boneless, skinless chicken breasts". Ugh. I think that was probably in the 80s. Not a fan. I'm glad to see chicken thighs being used more widely (I've always used them). I remember when you were considered uncivilized to use oil-packed tuna (also the 80s, I believe). I think there was some kind of low fat mania/fat phobia back then I always use tuna in olive oil--it's finally more widely available. The good tuna ventresca has always been in oil. Ever try to make tuna salad with that water-packed crud? You'll never get it to emulsify properly--ever hear of oil & water? I remember milk being either whole or skim. My grandmother drank skim, and I always wondered why anyone would drink gray milk! Or any milk, really, because I never liked milk (except the fresh milk from our cousin's cow). Soda was made with sugar, and a real Coke was a treat rather than an everyday thing. Tuna in oil was much better. Tuna in water became a big thing in the 80's, like diet soda (Tab, Diet Pepsi, Pepsi Light, diet Coke). And then ZOMG caffeine BAD, so Pepsi Free, CF diet Coke, etc. McDonald's fries in beef tallow were the best! They should go back to that. The fries are just not as good anymore. I think most of the foods back then are still available, other than the milk - we ate more simply. There's a hugely greater variety now. It's just that most people are now cutting down on some of the fatty foods we used to eat then ...... it's still possible to have those foods, though some like T-bone steak are much more expensive now. At the moment all I can remember is grilled steak topped with fried onions and mushrooms, heavily buttered mashed potatoes ...... that was commonplace back then, rather than a rare treat like now. I'm thinking of that while I'm cooking some "healthy" rice and chicken slop. Yes on the boneless, skinless, chicken breasts! That's something that hasn't been around long. That's true; I've never been a fan of white meat. Well, except for wings, but that might have to do with the fact that they have a high proportion of breading. Seriously, the best meat is juicy, and breast meat dries out very easily. Also, the skin is the best part. I love the thighs with the leg attached. Juicy. Yes! We use leg quarters a lot here. And if the back is still attached, I save those in the freezer to make stock. 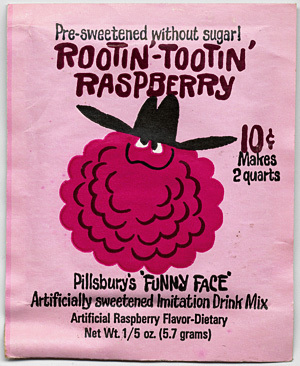 Hmmm, I never knew about those sweeteners back in those days. I do remember Sugar Twin though. We very seldom drank soda and if we did it was ginger ale or Coke. Never heard of Funny Face. My younger sisters had cool aid--it was horrible and it came in neon colors. I'm glad I was almost grown up by then. We drank Zarex ?? for a little while. It was a syrup that you mixed with water. It tasted only slightly better than cool aid. An at home drink treat would be chocolate milk made with Bosco. HOLLYWOOD Bread. I think that was it. Chicken cooked without skin has hardly any flavor of its own. I never eat it. For frying, amixture of lard and walnut oil really hits the spot. My mother used Crisco in the days before it was "pure vegetable". Canned tuna in water is terrible although cats seem to prefer it, but not dogs. There's a recipe floating around the internet claiming to be an adaptation of Julia Child's tuna casserole. It has such tasty items as diet mushroom soup, 2% milk, and presumably healthy brown rice. UGHH! I tried to find the original but no luck so far. Lazio Tuna seems to be available only from Lazio's distributor which they own. I'll call them Monday. If sainted Julia liked it it must be good. Lazio seems, however, to have targeted a new market. Note the second link.